Modernmini sells modern-style babies’ and children’s furniture, toys, bedding and more. Its site is powered by the Zoovy platform. Founder Pazit Kagel, a designer and mother of three, requested a site grade, and I’m happy to oblige. The URLs contain session IDs — a no-no for SEO — but upon review of the cached version of the home page, I was relieved to find the session IDs are not being assigned to Googlebot. It appears there is “bot detection” happening behind the scenes, so when a spider like Googlebot is detected, session IDs are removed from the URLs in the links. I double-checked and none of the session ID-containing URLs have made it into Google’s index. The session ID notwithstanding, the “product” and “category” URLs are relatively friendly to search engines. However, the product URLs do not contain keywords; they are product number-based. Ideally, the URLs should include keywords. The “shop by product” and “shop by department” nav buttons are set up as mouseovers with lots of text links under the mouseover. The mouseovers are executed as CSS, so the links function as crawlable static text links — ehhh-xcellent! (as Mr. Burns would say). The site doesn’t do a 301 redirect from Modernmini.com to www.modernmini.com, which means two copies of the site will get indexed — one at www.modernmini.com, and one at modernmini.com. A number of pages appear in Google’s Supplemental Index. 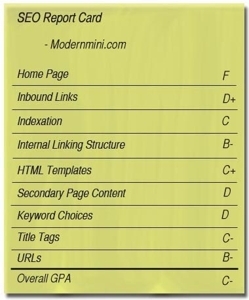 Many of these are Modernmini.com pages rather than www.modernmini.com. Installing the proper redirects should clean up some of these supplemental results. In the category and product pages, “Modernmini” is the first word in the title tag. That is not ideal; important keywords should lead in the title tag and “Modernmini” is not a useful keyword. I wouldn’t bother moving it to the end of the title tag. I recommend it just be removed. It would be nice to see the main content of the page higher up in the HTML in a more prominent spot. Using CSS, you can reorder the HTML — putting the left-hand nav lower in the HTML with content placed above it. Prominence could be further enhanced by removing the inline CSS code that bloats the page; instead, place it in an external CSS file. The site uses breadcrumb navigation, but unfortunately, the breadcrumb all but disappears at the product level — only the “home” part of the breadcrumb remains. This seems to be a bug. It is not clear from the title tag or from the body copy what the main keyword theme of the home page is. I would think that “children’s furniture” or “baby furniture” would be appropriate keywords to target, but surprisingly the word “furniture” doesn’t appear on the home page at all — only tucked away in the meta description tag, which won’t help Modernmini’s rankings. Product names are used as the title tag content on the product pages. Sometimes this approach is fine, and sometimes it’s less than ideal. For example, the Celery Lullaboo Rocking Cradle really should include the keywords “baby” and/or “infant” in the title tag, and probably “wood” or “wooden” as well. The product pages do not make use of H1 heading tags. The product name is not given extra weight by the search engines, as it employs the same font treatment as the rest of the copy. The site could really use a custom 404 error page. Given the number of Modernmini listings in both Google’s and Yahoo!’s indices that lead to those very ugly “404 Not Found” error pages, fixing this problem should be a priority that gets prompt attention. The Modernmini.com site appears to have suffered in the past from a server misconfiguration that allowed error pages to get indexed. The misconfiguration has been rectified, but many of these broken pages are still hanging around. Thus, visitors directed by the engines to such pages have a poor user experience; they are unlikely to do anything but immediately click out of the site. Develop a custom error page to suggest related pages (based on the visitor’s search query) and prominently offer a search box and site map.